The Grey-Banded king snake was once considered to be a sub-species of the Mexicana king snakes, but has recently been elevated to full species status in it's own right. Occassionally, the Grey-Banded King Snake can be described has being two sub-species, Lampropeltis alterna alterna and Lampropeltis alterna blairi, but it is under debate as to whether these are actually the same. Generally though, the differences between the two is defined by the location of the snake and the order of the banding. Lampropeltis alterna alterna is said to have orange, red banding, whilst Lampropeltis alterna blairi has red, orange banding. Colouring: As their name suggests, Grey-Banded king snakes have grey bands running along their bodies. They usually have some black saddles with varying shades of other colours, such as red or orange running in in rings along the body. The colouration of the snake will depend on whether it is from the Blair's phase or the Grey-banded phase of the species. Breeders are yet to produce Albino Grey-Banded kings. Size: Grey-Banded King snakes can grow up to 4 ft in Length, with the average being about 3ft. Females tend to grow larger than Males. Life Span: 15 years is average for a King Snake in captivity, but it is not uncommon for them to reach 20 years with appropriate care. Origin: Mexico and Texas. They are considered an endangered species in New Mexico. Habitat: Grey-Banded King snakes are usually found in canyons and sheltered rock faces. They spend a lot of their time underground, as they live in extremely hot, dry areas and need to avoid the heat. They have a relatively docile temperament and can be easily tamed. They are energetic and inquisitive and make very interesting pets. They are easy and safe to handle, growing to a manageable size and make a good choice for people who are new to snake keeping. Hatchling king snakes tend to be a bit feisty, but will soon tame down with regular handling. They are likely to try and bite when cornered, but this is a defensive tactic that will cease when the snake becomes more comfortable with your presence. King snake bites rarely hurt and should not deter you from keeping a king snake as a pet. King Snakes are quite active snakes and will appreciate time outside the vivarium to exercise. Kings have been known to be a little nippy, but regular handling should calm your King Snake down in time. It is not uncommon for King Snakes to musk if they feel threatened. King snakes are powerful snakes, but are still easy to handle. Grey-Banded King Snakes in the wild will eat a very varied diet of rodents, eggs and lizards, but King Snakes in captivity can be fed entirely on mice or rats and still be healthy. The rodent should be of a appropriate size in comparison to the size of their mouth and be large enough to leave a bump in your King Snakes body once ingested. Hatchlings start on pinky mice, one every 5-6 days and graduate up to an adult mouse every 7-10 days as they grow. Very large snakes may require 2 adult mice per feed or even the introduction of larger prey items such as rats. You may also feed a mature King Snakes on day old chicks to provide a variation in diet. Do not feed your snake with live food, even a small mouse may bite or injure your snake. Shop brought frozen rodents are available from most pet shops or bought over the internet these can be thawed to room temperature and make an excellent all round food for your snake. Wild rodents carry parasites and should be avoided at all times. Never handle your snake straight after a feed, as it will regurgitate its meal. King Snakes are quite active, but do not need huge enclosures. A medium sized vivarium (Even a fish tank with a tight fitting lid) will house your King nicely. The vivarium should allow a minimum of 1 square foot of floor space to each foot of snake and be approximately a third of the snake’s length in height. Hatchlings should start out in an appropriately sized small vivarium or RUB (Really Useful Box) as they can become stressed and stop feeding in an oversized vivarium. All Snakes are excellent escape artists, so care must be taken when planning their housing. Make sure your vivarium or tank has a tight fitting lid, which can be clamped down. King Snakes are very strong and can push a loose fitting lid from a vivarium. King Snakes may grow up to 6ft in length, but do not necessarily need a large vivarium. They will feel more secure in a suitably sized vivarium, which should be around 4ftx2ft for an adult, dependant on how big your King Snake grows. Warning: King snakes are known for their cannibalistic tendencies, so it is important that they are always housed individually to avoid any mishaps. Aspen shavings may be used for King Snakes. The shavings cannot be cleaned and so have to be removed and replaced with fresh shavings when dirty. If you use aspen shavings the urine and feces can be scooped out with a cat litter scoop, and replaced with fresh aspen as needed. Be sure to remove soiled substrate as soon as possible; urine-soaked material will become a breeding ground for bacteria, which could harm your King Snake. If you use this type of substrate you will have to place your snake in a secure area to feed it; you do not want it to ingest any of the shavings. At least once a month, all shavings should be removed and disposed of, and the entire enclosure cleaned and disinfected before new shavings are placed inside. This is particularly important if your King Snake has musked inside the vivarium, as the musk is a diluted form of excrement, which should be removed as soon as possible. Do not use Cedar or Redwood Shavings these are toxic for all animals and should never be used in predator or prey enclosures. Cedar and redwood should not be used in constructing housing for any animal, nor in any furniture or paneling in a vivarium in which any animals are housed. Newspaper: Layers of newspaper have been used for years in animal keeping. It is relatively absorbent when several layers are used, and inexpensive to replace. However, the inks used in printing are known to be harmful to animals. Unprinted sheets may be obtained at shops selling moving supplies, or roll ends may be obtained from some newspaper companies. As with printed newspaper, it is relatively absorbent when several sheets are used, especially when layered with paper towels. Unlike printed newspaper, the unprinted sheets and rolls are not impregnated with potentially harmful inks that could harm your King Snake. Easily obtained and relatively inexpensive, paper towels make an excellent substrate for reptiles with belly injuries and those in the early stages of quarantine. Beech Chippings: Beech Chippings are readily available from most Reptile shops and are quite an attractive substrate to have in the vivarium. It comes in three different grades - small, medium or large, so you can choose the size which is most suitable for your snake. It allows for spot cleaning, although it is not as absorbent as Aspen. It is not a good substrate for burrowing snakes. Coco/Orchid Bark: Some reptile shops may recommend the use of Coco or Orchid bark for King Snakes, but this substrate is more appropriate for snakes that require higher humidity levels. It is unadvisable to use this substrate for King Snakes as they are susceptible to respiratory infections (R.Is) if the humidity becomes too high. Astroturf® was the first artificial grass floor covering. Since then, carpet manufacturers have come out with many grades of artificial grass. Hardware shops usually have two or more grades. The least expensive is generally the best to use. It is more flexible, a key factor for thorough cleaning and disinfecting. Pieces can be washed and disinfected repeatedly before they require replacing. Astroturf® is cheap enough that several pieces can be cut for each enclosure and rotated each cleaning day. The pieces of artificial grass substrate sold in small, prepackaged pieces in many pet shops and mail order pet suppliers are the same as the product sold in builder supply shops. King Snakes are cold blooded and get heat from their surroundings. In the wild snakes bask in the sun to keep warm or move to a shady spot if they are too hot, this is called thermo-regulation. The ideal temperature for the warm area of your snake's vivarium is around 27-33°C (81-91°F). Heat should be provided using either a heat mat with thermostat or a bulb with a dimming stat on the roof of the vivarium surrounded by a bulb guard. Heat mats should only cover between a third and a half of the floor space to allow your snake to thermo-regulate. 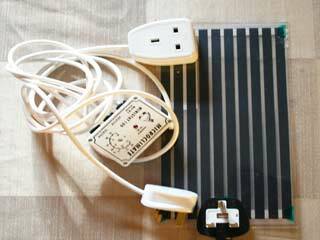 This heat mat should be regulated by a thermostat to ensure that it does not overheat. Since a heat mat should provide sufficient heat to keep your king snake happy, a basic mat stat, like the Microclimate Ministat 100 or the Habistat Mat Stat, should be appropriate. These thermostats are available from reptile shops and online, are relatively cheap, and will ensure the heat source is regulated at a safe level. A popular alternative to the heat mat is a normal light bulb on the roof of the vivarium, attached to a dimming stat. It is important to ensure that the heat source is protected from direct contact with you snake by using a guard. King snakes do not feel heat in the same way that we do and do not always realise that something they are touching is burning them. A bulb guard will ensure that your king snake will stay a safe distance away from the heat of the bulb so burns will be avoided. The disadvantages of using a bulb as a heat source is that the bulb needs to be turned on constantly to keep the vivarium at the correct temperature. Your king snake does not require light 24 hours a day and can suffer from stress if the light exposure is too long. It is recommended to keep your king snake in a natural light pattern that mimics normal daytime, so a heat mat is a better choice between the two heat sources. If you do decide to use a heat mat, then a energy-saving bulb with guard can be added to the vivarium for decorative purposes to help you see your snake. King Snakes do not require a U.V lamp in their vivariums. All King Snakes need somewhere to hide and may become stressed if this is not provided. This could be a cardboard box with a hole cut into it, which can be easily replaced if it becomes soiled. Flower pots also make good hides for King Snakes. Specialist reptile hides can be purchased from pet shops and over the Internet; these can be cleaned when you clean the rest of the vivarium once a month. Any hide should be just large enough for your King Snake to curl up in; if it is too large the snake will not feel as secure. In general, it is wise to place two hides in your vivarium for your King snake to use, one in the warm side of the vivarium and one in the cooler side. This enables your snake to have adequate hiding places along the temperature gradient, which would allow your snake to adjust its body temperature. This is important, because for some King Snakes, the instinct to hide is often more insistent than the instinct to keep at the right temperature. If the snake does not control his body temperature it can lead to many problems, the least of which being digestive problems. Branches and plastic plants can be bought from pet shops and over the internet these provide a place for climbing and resting, they also aid the snake when shedding its skin. King Snakes appreciate being able to climb, as it will keep them active and provide vital exercise. Branches collected from the wild will need to be debugged by soaking first in chlorine/water solution, then rinsed thoroughly, soaked in clean water, then left to dry in the sun. Some live plants may be harmful to your King Snake, if in doubt don't use them in your Vivarium. King Snakes are very inquisitive animals and like to explore new surroundings. Once in a while change the layout of the Vivarium; this will keep your King Snake from becoming bored. You will notice once you put your snake back in the tank it will start to re-explore its new surroundings. King Snakes can be quite territorial and will soon call their vivarium home after a few weeks. Do not worry if they become defensive or musk more often in their vivariums, this is normal King Snake behavior as they are simply marking their territory and trying to protect it. All King Snakes need fresh water to drink daily. Water should be given in a reasonable sized bowl which is fairly heavy to stop your snake tipping it over. Water can also help your snake during shedding at this time your snake may be found bathing in the water. If the snake defecates in its water bowl, the bowl must be cleaned and disinfected immediately. Grey-Banded king snakes prefer a warm, dry habitat, so try not to raise the humidity too much, as you could risk your snake developing a respiratory infection (R.I). 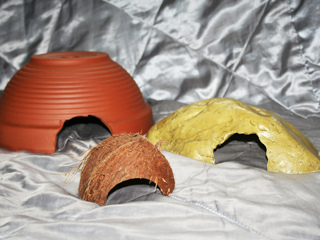 A damp hide might be useful to help your snake during the shedding process. 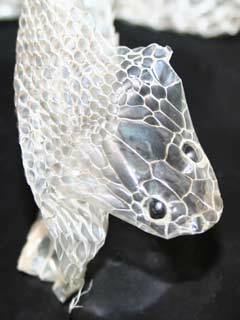 King snakes, like all other snakes, shed their outer layer of skin periodically throughout their lives. Young snakes may shed more frequently than adult snakes, but in general the shedding process occurs several times a year. This is nothing to worry about as a keeper, but there are a few things you can do to help your snake through this process. Preecdysis is the name given to the changes your snake will go through whilst preparing to shed it's skin. This will include a dulling of your snake's skin colour, general inactivity and their eyes will turn a bluish grey colour. At this time your King may refuse a feed or shy away from being handled, but this depends on the individual snake and how they handle preecdysis. While your snake is 'in blue' it is advisable to handle with care as their vision is obscured by the membrane covering it's eyes and they may feel more insecure than usual, therefore more likely to be defensive. Some snakes will handle a shed without any need for extra help, but if you want to assist your snake during this time you should try to raise the humidity in your Vivarium to help your snake loosen it's skin. You can do this by placing a larger water bowl in the vivarium so that your snake has the opportunity to soak itself if desired. You can also lightly mist the tank with water to help raise the humidity. Another useful tactic is to place a humidity box in the Vivarium. This can be a sandwich box with a hole cut in the top filled with damp sphagnum moss. Your King snake should appreciate the extra humidity and it will make the next stage in the process easier for it. Ecdysis is the act of shedding, which is usually started by your snake rubbing it's head on rocks or decor to loosen the skin around it's head. Once it has worked it's head free it will continue to crawl its way out of the old skin by rolling it inside out has it moves. Once your snake has shed it's skin it should be removed from the vivarium along with any faeces that usually accompanies Ecdysis. Check your snake to ensure that the shed skin has successfully been removed, taking particular notice that the eyecaps and tail end have not been retained. If necessary bathe your snake and remove any patches of skin that have not been shed with a warm towel or tweezers, to avoid infection or death of the tissue below it. King Snakes are a hardy snake that would rarely become ill with appropriate care, but here is a quick introduction to a few disorders that need to be looked out for. Mites: Mites are little black parasites that live on your King Snake and feed on their blood. If your King Snake catches mites they can usually be found around the eyes, mouth and under scales. Your snake will seem lethargic and may go off it's food during a mite infestation. If you discover mites on your King snake, immediately bathe your snake in warm water and fully disinfect the entire tank and contents. Refill your vivarium with white kitchen roll and leave the cage furniture to a minimum. This helps stops the mites being able to breed as they need substrate to lay eggs and also allows you to see them more clearly while you monitor your snake. Repeated bathing and disinfecting of the vivarium helps, but it unlikely that you will remove a mite infestation without some sort of treatment. Reptile shops sell various treatments to help kill off the mites, but some vets may prescribe a weak dose of Frontline if they feel it is necessary. Respiratory Infections (R.Is): R.Is are a bacterial infection that is usually caused by poor cage conditions, low temperatures or too much humidity, but can be passed from snake to snake too. King Snakes may sound wheezy with excessive saliva and nasal discharge. Their mouths may also gape open as your King struggles to breathe. Very mild R.Is may go away themselves if the conditions that the snake are living in are corrected, but serious infections need to be seen to by a vet immediately to avoid Mouth Rot or even death of your King Snake. The vet may prescribe an anti-biotic called Baytril, which is safe enough to be given to your snake. Regurgitation: When a snake regurgitates it's meal, it may not necessarily be down to illness, but as regurgitation is a symptom of many digestive problems, illnesses and stress it is recommended that if your King Snake does regurgitate it's meal that you monitor your snake very closely for further symptoms. Sometimes a King Snake may regurgitate it's meal if it is handled too soon after a feeding or if it has been fed an item that is too large for it. In this case, you should leave the snake to settle back down for a week before trying to feed again. If your King Snake repeatedly regurgitates it's meal, loses excessive weight or shows any other signs that are worrying you, seek medical attention as soon as possible. This care sheet is a simple step-by-step guide to successful King Snake keeping, but if you have anymore questions or need more specific information about the keeping of King snakes, please visit our forum. It is a useful resource where you can ask members to share good practice and also talk about your experiences of being a King Snake keeper.